The second season of Disney’s Star vs. the Forces of Evil premieres on Monday on DisneyXD and despite a not too critically great first season, the show comes in with a ton of potential. The first season (which I’ve just finished marathoning) is a great blend of cute animation, a modicum of world building, and genuinely good characterization. It doesn’t amount to the upper tier of animation on television today, but it’s a fun and genuinely good light mix of, weirdly, shows like Gravity Falls and Rick and Morty. At the heart of Star is of course Star Butterfly. Star is really great and easily one of the strongest elements of the show. She’s adorable, fun, a complex character, and maybe most importantly seems like such a real person. 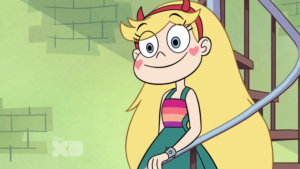 Star is the maybe the first characterization of a 14 year old girl that I’ve seen that isn’t such a stereotypical teenager. 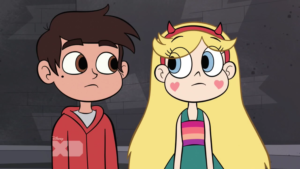 Star is a kid; it’s something that really comes across on the show, and is something that’s true of young teens in the real world. Star isn’t boy-crazed, moody, any teen stereotypes, and she doesn’t have to be just because her age ends with ‘-teen’. 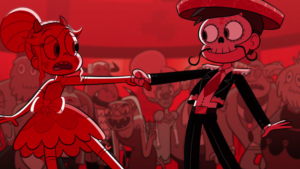 The main characters really are the heart and best part of this show, because Marco, the other lead, is really strongly characterized as well. Marco’s role on the show is clearly the secondary lead role, which is so refreshing and great; in the finale he’s the one captured and Star has to save him! And he really shines in the role he’s given. Marco is a genuinely sympathetic male character, something that I rarely find these days. And the two of them together, that’s the best part of the show and where the Gravity Falls of it comes in. Dipper and Mabel’s relationship was the absolute best part of Gravity Falls for me, and I feel the same way about Star and Marco. Their friendship is so pure and just makes you happy. We constantly see them support each other and have fun together. 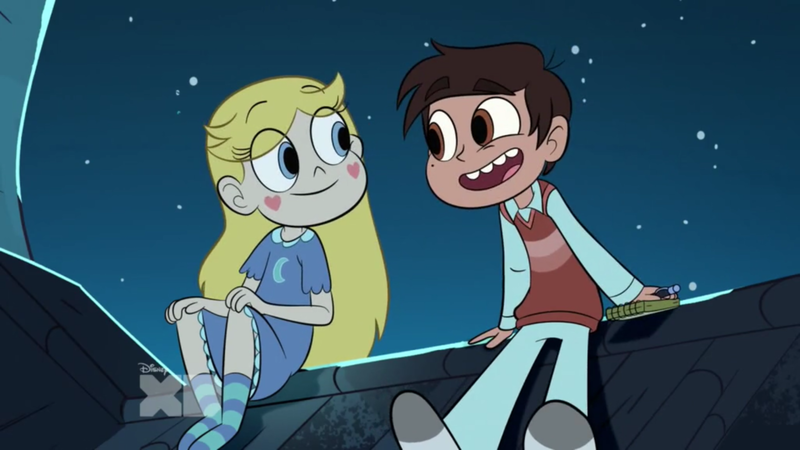 Seeing Star come to Earth, have Marco become her closest friend, and not have their relationship have any romantic underpinnings is almost unbelievable. Not in its real-world realism (14 year old boys and girls can be friends in the real world too! ), but as an element of a TV show. This Disney Channel show really didn’t do a romance between its male and female leads in the first season?? Sure there was “Blood Moon Ball”, which probably launched a thousand ships, but that’s okay. Because that wasn’t until the second half of the season, and it didn’t even go into clearly romantic territory. 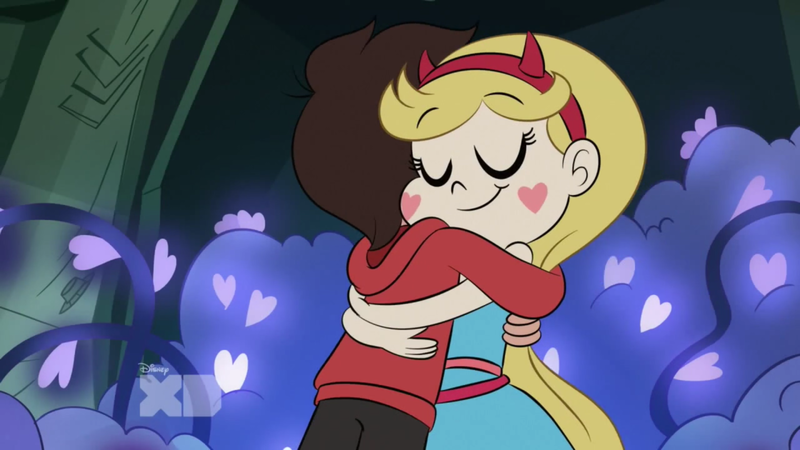 Star and Marco could totally start dating now, and it would still be incredibly refreshing because they have such a solid foundation of friendship and caring. It would be subversive and its own right and I’m not even sure if I’d rather see them together romantically or just staying the best of friends. None of this has to do with the plot of the show, because it’s largely unimportant. But that’s where the Rick and Morty comes in. 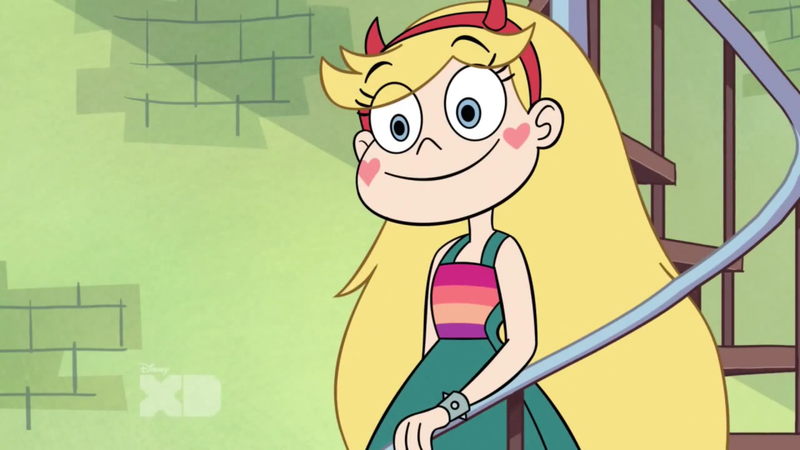 Star has a pair of interdimensional scissors (Rick’s portal gun!) and in about half the episodes her and Marco use them to go to other dimensions. The other half feature Star and Marco fighting monsters on Earth, led by Ludo, a pretty fun villain. But really, who cares? 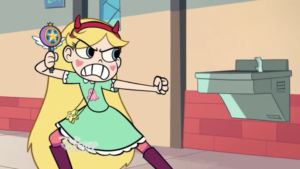 I love seeing Star and Marco fight, it’s always fun, the dimensions they visit are creative, Ludo’s monsters when characterized are actually interesting, and Star and Marco’s classmates, the supporting cast, are interesting in their own right. But really, this is the Star and Marco show, and keeping it that way was such a smart decision, playing to the show’s strengths throughout its first season. That’s all good stuff, so why isn’t this top tier television? Well, over half the episodes aren’t great. “Star Comes to Earth”, “Party with a Pony”, “Blood Moon Ball”, “St. Olga’s Reform School for Wayward Princesses”, and “Storm the Castle” are the highlights, and are genuinely good episodes. But the rest all at least have elements of meh to them. None of them are bad by any means, and at least have some fun parts to them, but the narrative and even some of the characterization really isn’t there for most of the season. So really there’s a lot to love about this show. No, it’s not top-notch television, and it probably won’t suddenly become so in season two. 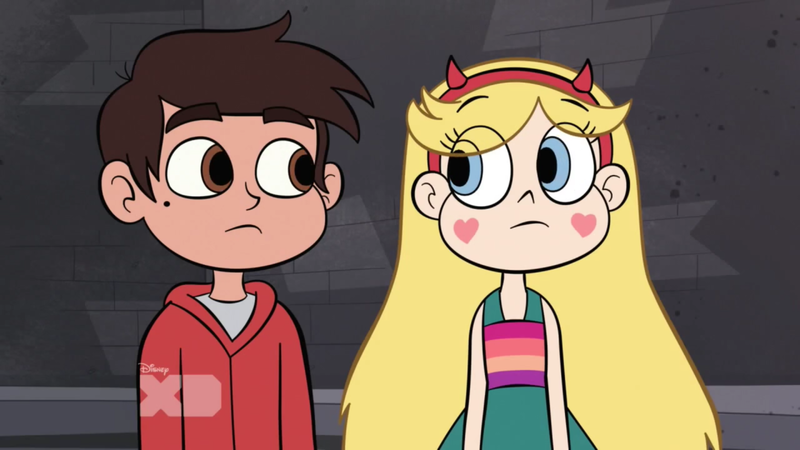 But the foundations are there for it, especially with Star and Marco. And even if some episodes are still lackluster, even if we don’t get extensive plotting, this show will always be really fun and a breath of fresh air on television today. The Overly Animated Podcast will be covering Star vs. the Forces of Evil with week-to-week podcasts during its second season, starting on Thursday of this week. Well to me Star and Marco relationship it is pretty much Kim and Ron from Kim Possible, they are BFF and there is no romantic undertone at all from the beginning, and if they become romantically involved later on, that is okay, because you already establish the friendship long enough. 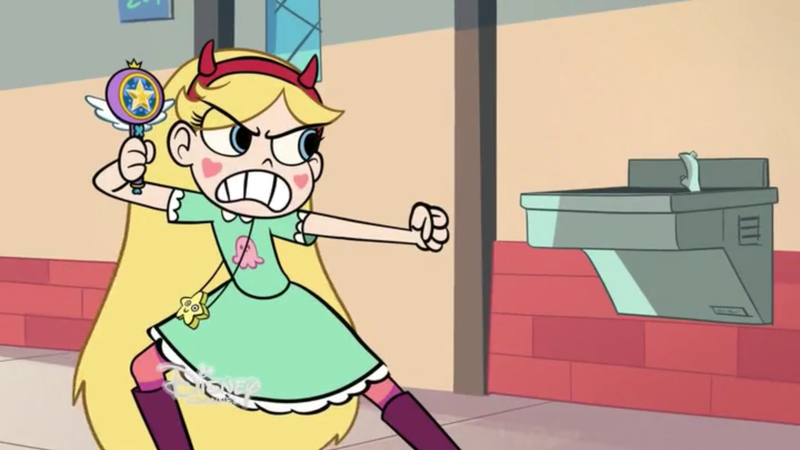 Here is a little trivia about the show, originally Star and Marco were suppose to be in Elementary school, Star was a girl who loved magical girl stuff and pretended to be a magical girl, Marco was not her friend, but someone who was jerk bully character to Star. Also in my opinion, Nickelodeon tried to get on the Star band wagon with their live action rip off show the Other Kingdom. I don’t care what anyone says, Nickelodeon put that show on the air because of Disney’s success with Star vs the Forces of Evil. And does it wrong, it has none of the fun of STFOE, it takes away way too seriously, and it has all those annoying troops that STFOE doesn’t have, like the whole keep everything secret from the humans, which I love about STFOE, granted Steven Universe did that first, but still. I only saw a couple of episodes of Other Kingdom because wanted to confirm if my suspicion were true and I was proven right. Speaking of which, the show does remind me of Steven, in that the world they set up kind of tricks you in what kind of a show it is. It looks so nice and bright, it seems like a funny harmless show, and than punch you in the face with some unexpected deep stuff, which is what Steven Universe did. Yeah Kim and Ron were the first comparison that came to mind for me and I didn’t even watch that show. I don’t think this show has any of the deep stuff SU has had yet, but hopefully soon! I am not saying it is Steven Universe, I am just saying it takes a similar turn from a nice little goofy series to something else. In the season 2 episode 1 podcast, are you guys going to give us your thoughts on season 1, or just talk about the season 2 premiere? Definitely gonna start by going over everyone’s thoughts on the show and season 1. Yes!I’m so glad you watched it!I’m actually fan from who’s listened to every podcast since 2008, but just haven’t said anything haha, maybe I should start recommending more stuff…anyways I’m very hyped for season two and have pretty high expectations(fun fact:Disney green-lit the second season before season one even aired).Though I must say I’m a bit surprised you didn’t talk about Toffee, or the subtle darkness and plot stuff the show has, what’d you think about it? Awesome, thanks for being a long time fan!! Toffee is cool. I didn’t mention most of the more minor characters but yeah Toffee was borderline major at the end. With him I just love that he’s the guy that did the dumb interview “you hired me” thing and the villain is dumb enough for it to work on, and then the guy who did it is the true evil one. Great stuff. Yeah Toffee he kind of pulled an Azula there. He did the exact same thin to Ludo that Azula did to Long Feng, just get the henchmen to trust and believe in him more. 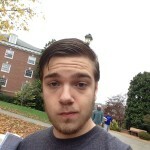 So have you heard of, seen, or familiar with the Other Kingdom? If that is not a Star ripoff, I don’t know what is? No I hadn’t even heard of it! Should I check it out at all? No it is terrible. It is just I and a lot of other people (read their IMDB reviews if you don’t believe me) think it is Nickelodeon ripping off Star vs the Forces of Evil with this typical trope live action tween dramedy. If you want to see how much like Star that show is, I guess, but I wouldn’t recommend it. It’s a live action Nick soap opera. The only one I enjoyed was House of Anubis, the rest are just bleh. Live Action + Nickelodeon – the 90’s = trash.